In the eyes of the Québec Religious Heritage Council, Quebec’s religious heritage is seen as a founding heritage because religious concerns and religious establishments have been present since the beginning of Quebec society. It’s the most universal, the most diversified, and the richest component of our entire cultural heritage. It’s also the most visible one and the one most spread out over our territory. It represents a major expression of Quebec’s culture and an important element of our identity, expressing the social, ethical, and philosophical values of our society. The Québec Religious Heritage Council has adopted the preservation and restoration principles recognized worldwide by the International Council of Monuments and Sites (ICOMOS). Acknowledgment of these principles must guide building managers and various building professionals in the protection and safeguarding of religious heritage. Preservation aims to preserve all features of the buildings (volume, materials, structure, decor, furniture, works of art, etc. ), and of the sites (landscaping, annex buildings, fences, monuments, etc. ), in the best possible condition. Religious heritage conservation also means regular care. Preventive care from "a small property owner’s perspective,", that is to say, maintaining the religious heritage in good condition and giving priority to repair over replacement, is still the first protection measure to ensure the timelessness of buildings, and to preserve their authenticity at the least cost. Preservation requires minimal and watchful actions to preserve significant elements that respect the heritage work and reflect its change over time. Preservation should include consultations with people and groups for whom the site evokes special relationships and meanings. The definition of the heritage value of the property, which flows from its cultural, historical, social, and architectural importance, will guide decisions on the work to be done. A body of knowledge, expertise, and know-how, (architecture, engineering, history, archaeology, specialized work…) is required to ensure the quality of the work to be done. This preservation work requires consulting with professionals, craftspersons, and competent experts who are renowned for the quality of their knowledge and their previous achievements in the field of heritage preservation. Professionals must produce a manual showing what has to be done, and how often, for maintenance and sound management of the property. The New needs and requirements due to standards (insulation, air conditioning, fire protection…) may require the use of new volumes, materials, or finishes that will be in harmony with the heritage characteristics of the property without creating any risk of deterioration. Architectural treatment of new additions to an old building must not depreciate the building’s appearance but rather respect it and add value to the design of the original structure. For work being done now, priority should always be given to reversible changes. Preservation of a heritage property prioritizes the use of techniques and materials used in its original structure. When needed, modern techniques and materials may be used as long as they are the best way to preserve the property, and as long as they have been tested in similar conditions. 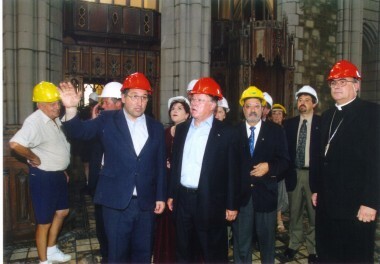 Restoration work stages of completion must be documented and these documents (plans, quotes, photographs, reports, etc.) must be kept in permanent archives. Knowledge and documentation about properties and projects must circulate and be made available to the public. The must be used according to its original purpose. Whenever there is recycling, compatible functions should be considered in order to minimize alterations, to maintain the heritage value of the building and site, and to favour community uses.